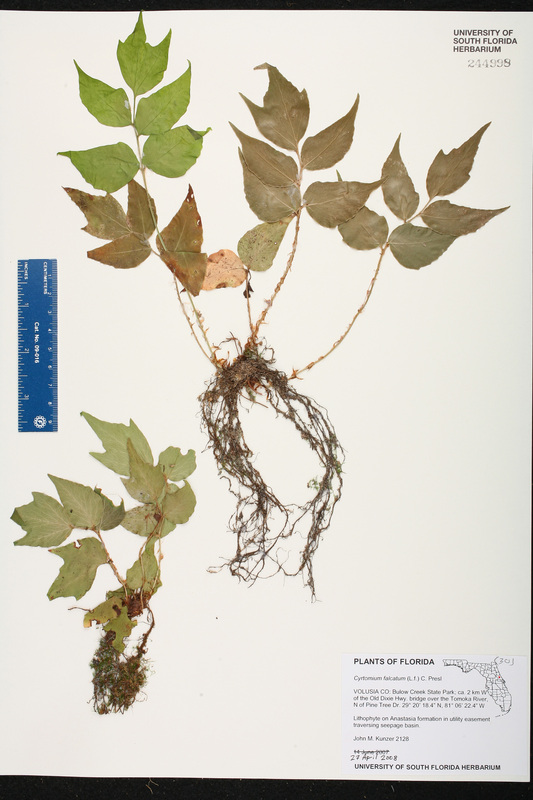 Citation CYRTOMIUM FALCATUM (Linnaeus f.) C. Presl, Tent. Pterid. 86. 1836. 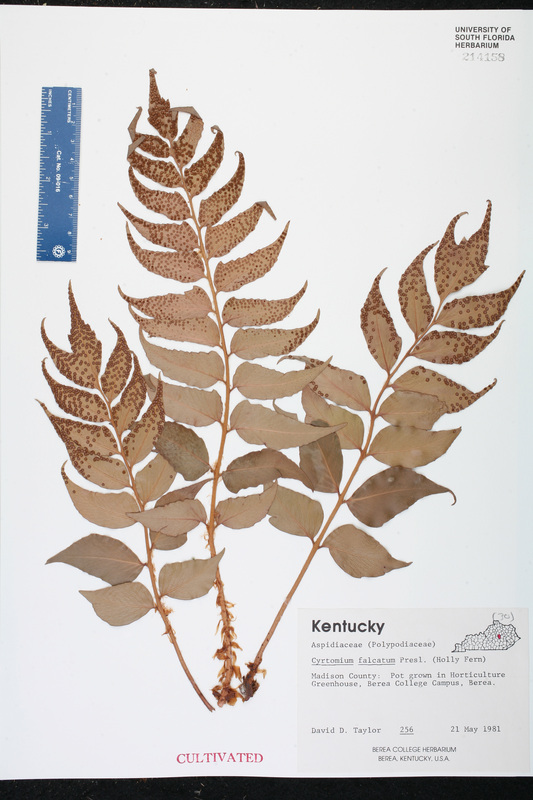 Basionym: Polypodium falcatum Linnaeus f. 1782. 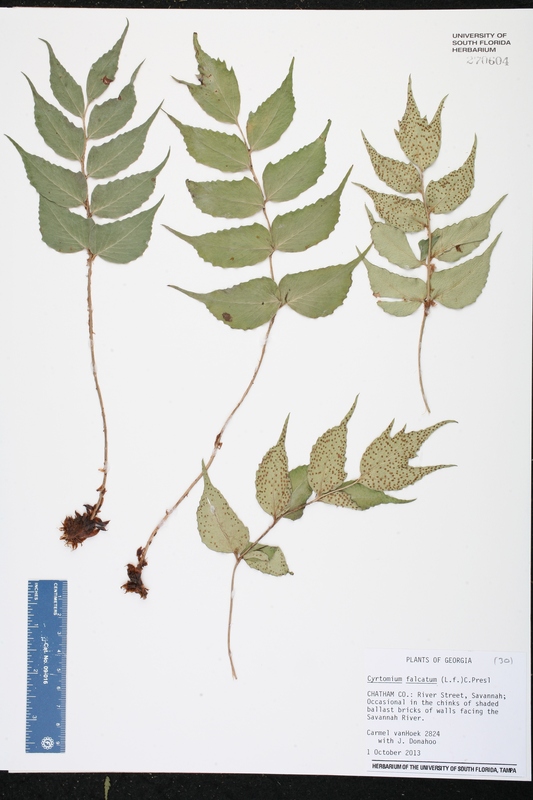 Aspidium falcatum Aspidium falcatum (Linnaeus f.) Swartz, J. Bot. (Schrader) 1800(2): 31. 1801. 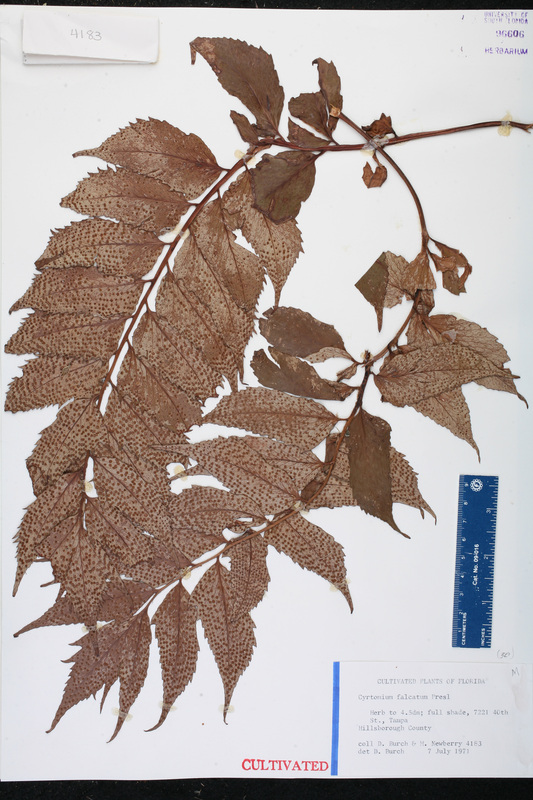 BASIONYM: BASIONYM: Polypodium falcatum Linnaeus f. 1782. Dryopteris falcata Dryopteris falcata (Linnaeus f.) Kuntze, Revis. Gen. Pl. 2: 812. 1891. 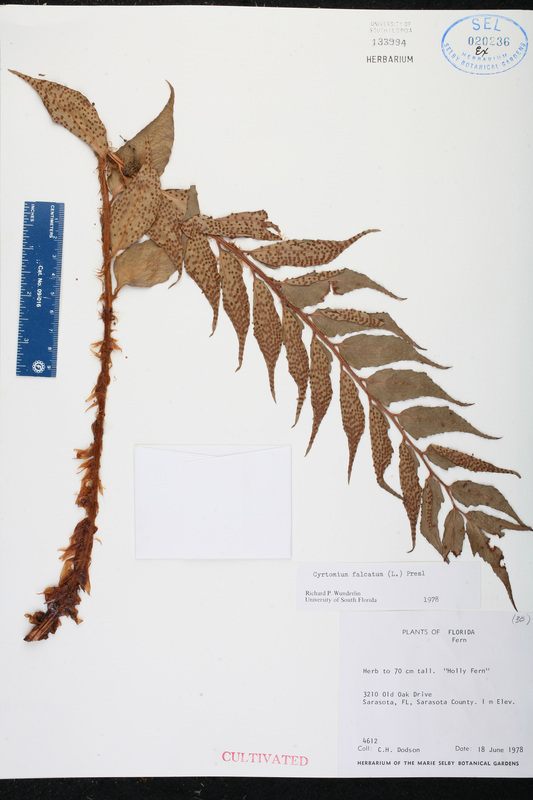 BASIONYM: Polypodium falcatum Linnaeus f. 1782. Phanerophlebia falcata Phanerophlebia falcata (Linnaeus f.) Copeland, Gen. Filic. 111. 1947. 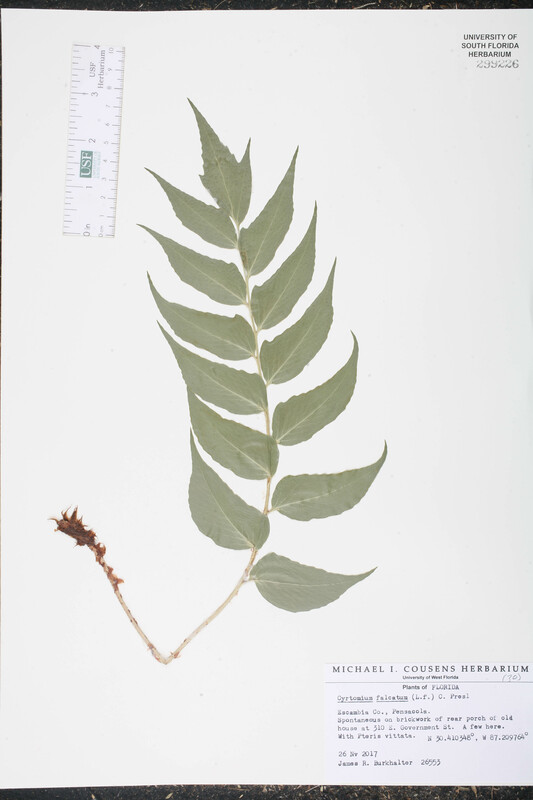 BASIONYM: Polypodium falcatum Linnaeus f. 1782. Polypodium japonicum Polypodium japonicum Houttuyn, Nat. Hist. 14: 167. 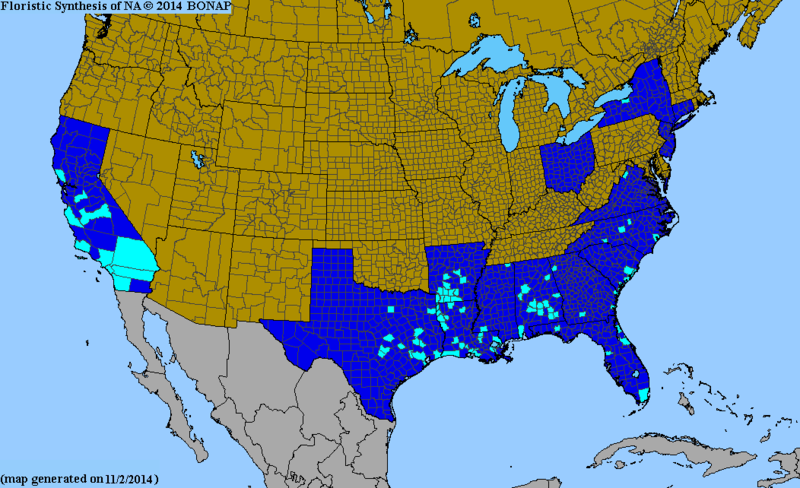 1783, nom. illegit. 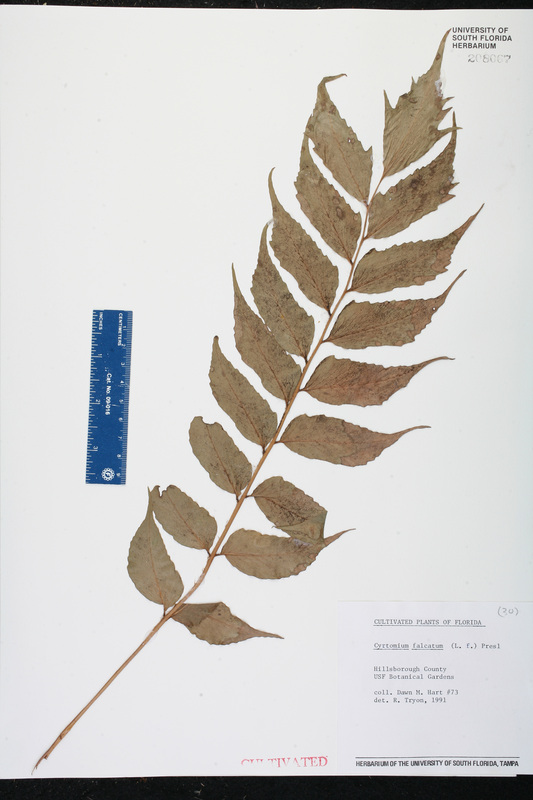 BASIONYM: Polypodium falcatum Linnaeus f. 1782. 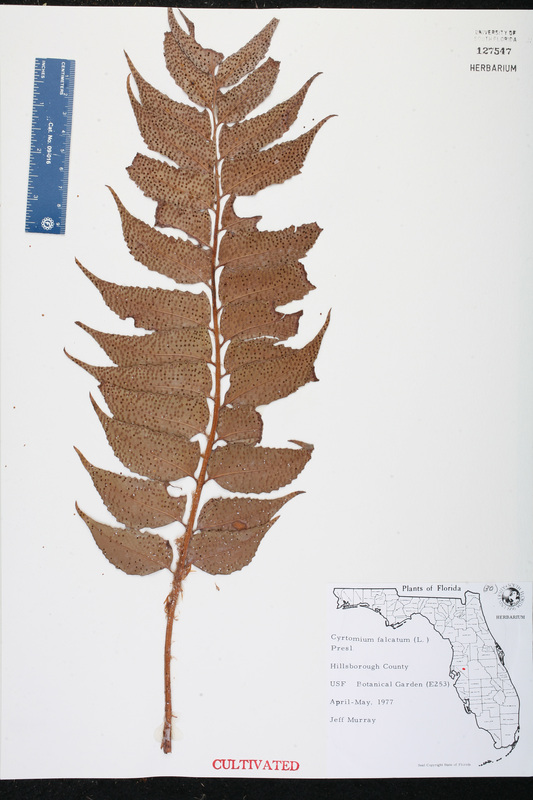 Polystichum falcatum Polystichum falcatum (Linnaeus f.) Diels, in Engler & Prantl, Nat. Pflanzenfam. 1(4): 194. 1899. 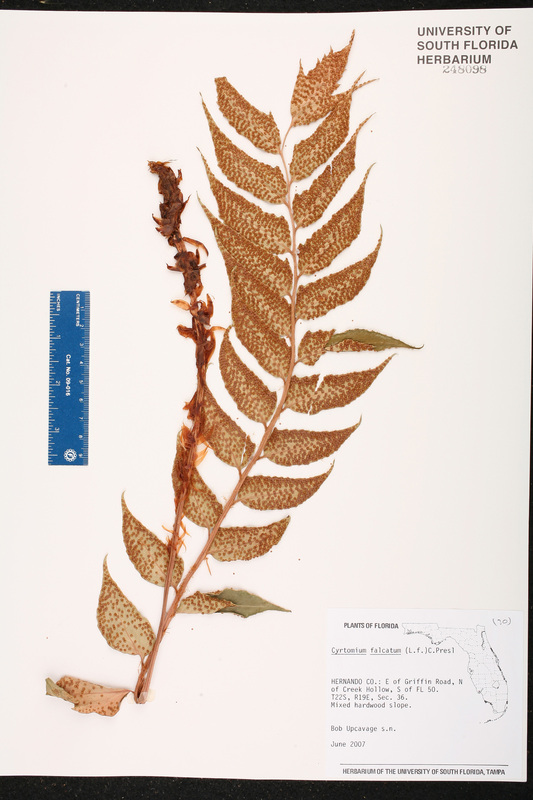 BASIONYM: Polypodium falcatum Linnaeus f. 1782. Cyrtomium acutidens Cyrtomium acutidens H. Christ, Bot. Mag. (Tokyo) 24: 241. 1910. USA Florida Hernando Co. Jun 2007 B. Upcavage s.n. USA Florida Hillsborough Co. D. M. Hart 73 CULTIVATED. USA Kentucky Madison Co. 21 May 1981 D. D. Taylor 256 CULTIVATED. USA Florida Hillsborough Co. n.d. D. Burch 4183 CULTIVATED. USA Florida Sarasota Co. 18 Jun 1978 C. H. Dodson 4612 CULTIVATED. USA Florida Hillsborough Co. Apr-May 1977 J. Murray E253 CULTIVATED.